Dunsfold is always an interesting show, year on year it delivers great variety and often a number of one-off formations. Being set on the last weekend of August the show often follows a very busy month for shows and could find itself at a stage where many have started to show fatigue from a busy year. Peter Teichman getting airborne ahead of a memorable routine. That’s where Dunsfold is often magic, it manages to have a great atmosphere, the large show ground means the event never feels too crowded and the mix of cars, aircraft and other ground attractions makes for a superb days entertainment. Of course it has to be noted that Dunsfold was the first British airshow to take place over land since new CAA restrictions had been brought in for vintage jets. On top of this it was the first show over land since the full effect of the Shoreham incident had been revealed. Shortly before the flying display started at 11:55 the airfield fell silent as we spent time thinking about those involved in the tragedy of the previous week. “Lulu Belle” rounds the corner at the end of the Dunsfold display line. 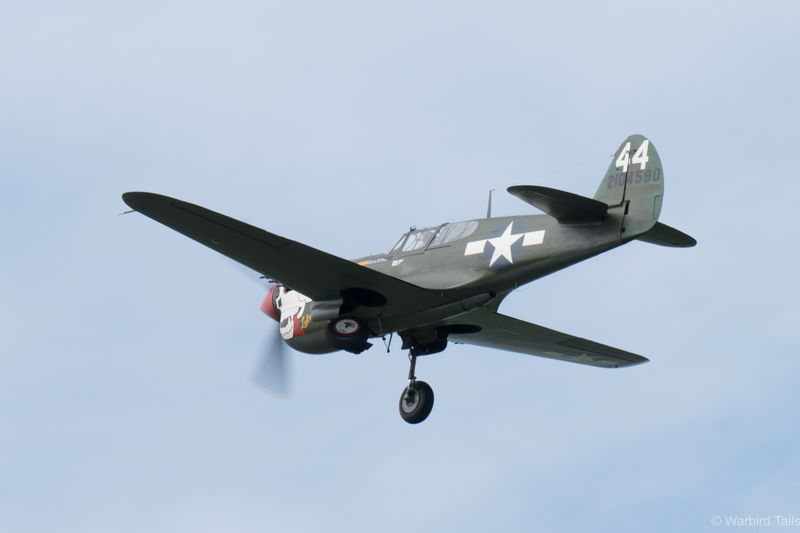 This silence was broken by the arrival of Peter Teichman in his Curtiss P-40M “Lulu Belle”. 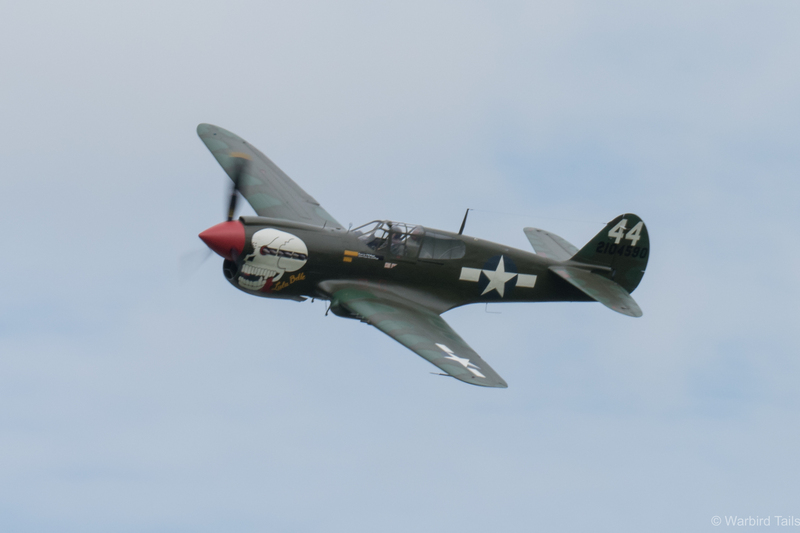 Arriving on the B-axis, Peter flew his Curtiss fighter through a typically graceful and flowing aerobatic display, the perfect reminder of why we all love these shows so much and how they can combine history with the spectacle of flight. 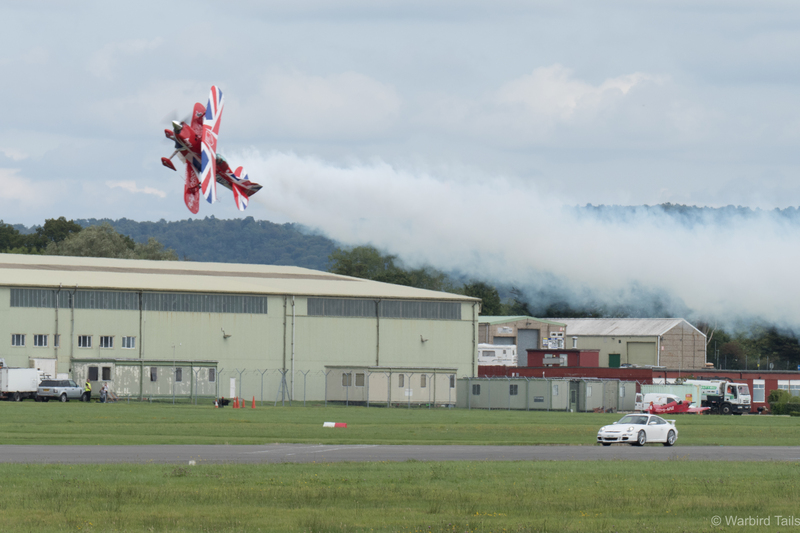 …just in case anyone needed reminding this was a Wings & Wheels show! 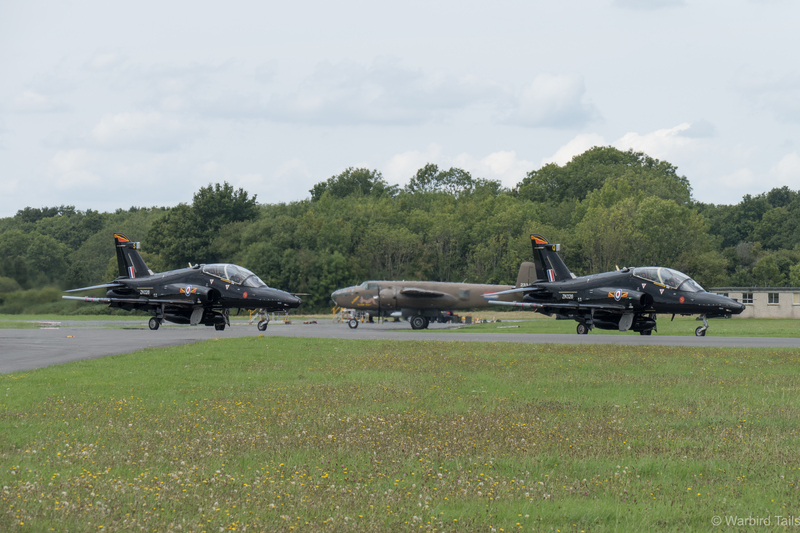 The morning display saw one of those special “Dunsfold moments” unfold. 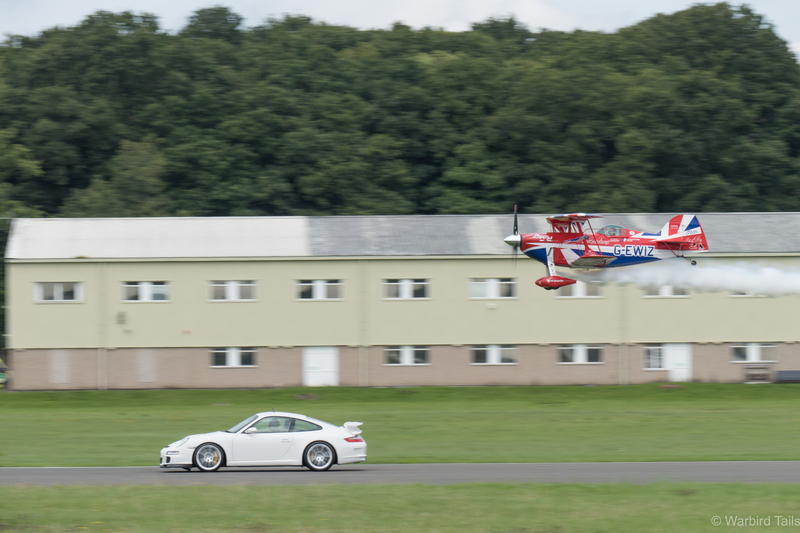 Never has there been a better representation of Wings & Wheels than Rich Goodwin’s pairs display with the Porsche down the runway prior to his usual aerobatic display. The short routine featured a “formation” take off and a number of opposition passes. Rich then went on to deliver his usual mesmerising solo in his modified Pitts special closing with his trademark low level knife-edge pass. An interesting twist on Dunsfold’s reputation for unique formations. It says a lot about the diverse range of acts at Dunsfold that the first four acts were a historic fighter, unlimited aerobatics a skydiving team and the Chinook! The latter of which never fails to impress especially with those breathtaking quick-stop turns. 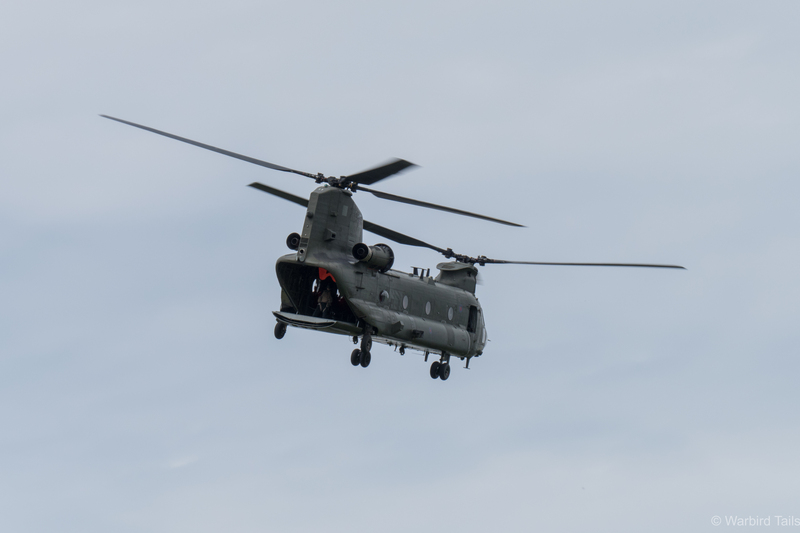 The Chinook during its display. 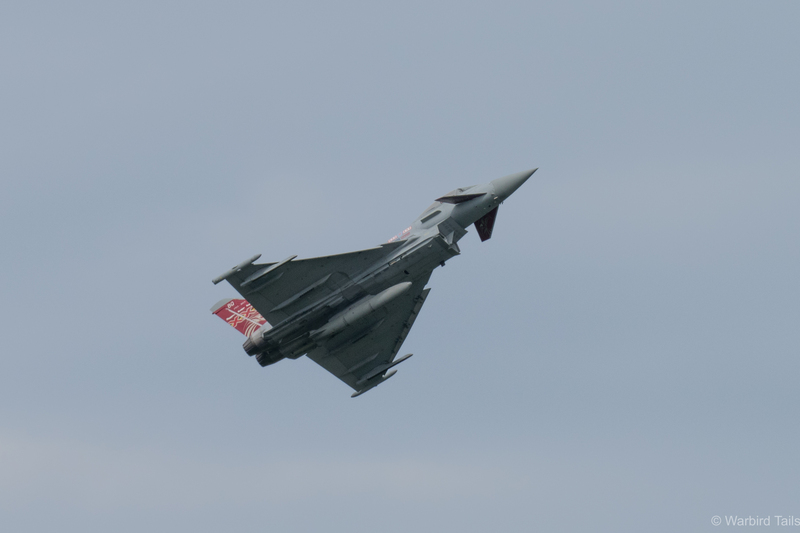 The RAF kept the show going with the ever impressive Typhoon solo, the first pass was especially striking and the flat display meant that there was plenty of noise on show. The Display Typhoon during its solo routine. A late addition to the display was Sally B on a rare away day from Duxford. The big bomber seems to be performing a higher energy display this year and its great to see, with plenty of fast flowing passes keeping the aeroplane in front of the crowd at all times. 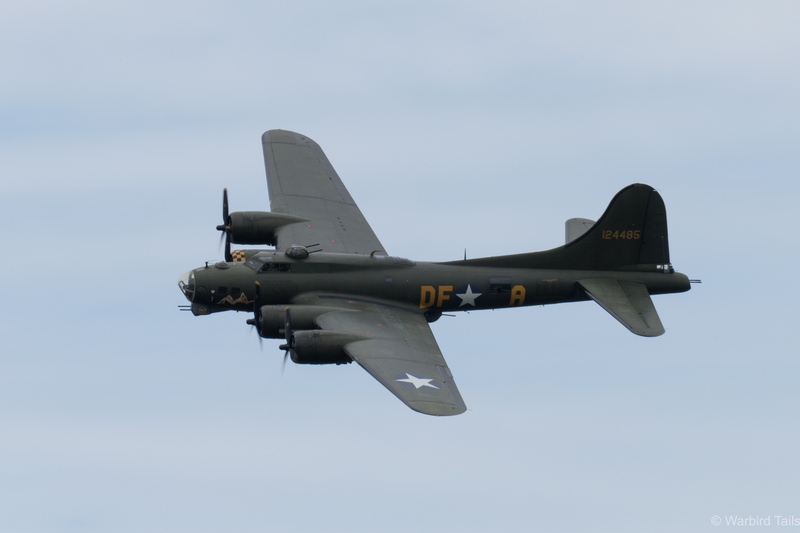 Sally B performed a graceful routine over Dunsfold. 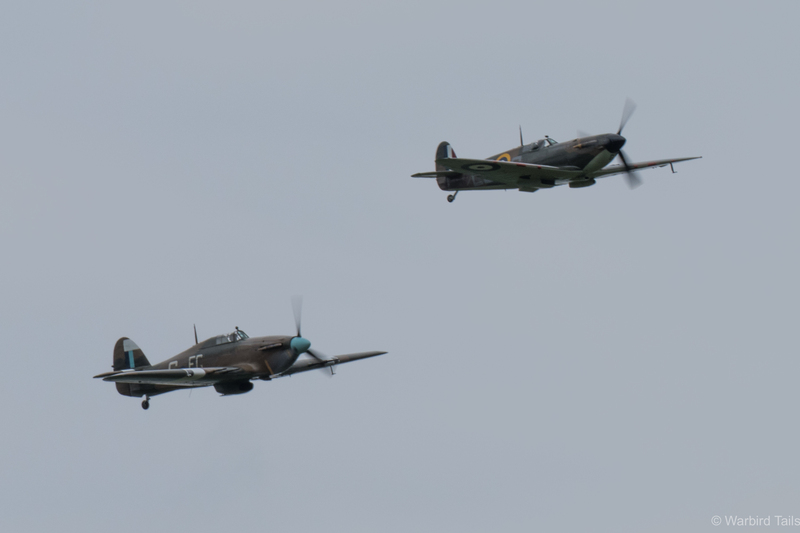 It was then back to the RAF for a Battle of Britain tribute, the BBMF sent a Spitfire and Hurricane pair consisting of P7350, a Battle of Britain veteran, and Hurricane PZ865, which has close ties with Dunsfold having been based there with Hawkers for a number of years. The very historic BBMF pair. After pairs and solo displays from the fighters we were treated to one of the final performances for the Spitfire and Typhoon synchro pair. Having seen this act a few times over the year it still leaves a long lasting impression with the sound of the Merlin being interrupted by the roar of the Typhoon and vice versa. I, no doubt like many, hope that this routine can remain as a regular act on the display circuit for years to come, especially with the 80th anniversary of the Spitfire’s first flight in 2016. The wonderful Spitfire and Typhoon pair. A new act to me was Guy Westgate’s solo slot in the Yak-52, which brought the morning flying to a close. I’d been thinking earlier in the year that there hasn’t been a regular Yak display on the circuit for a long while and this was something quite special. Following a low level departure Guy pulled the Yak round for a wingover before diving straight in for a barrel roll. The combination of low level aerobatics and the distinctive sound of the Yak made for a memorable display and a great new addition to the circuit. Guy Westgate rolling in the Yak 52. 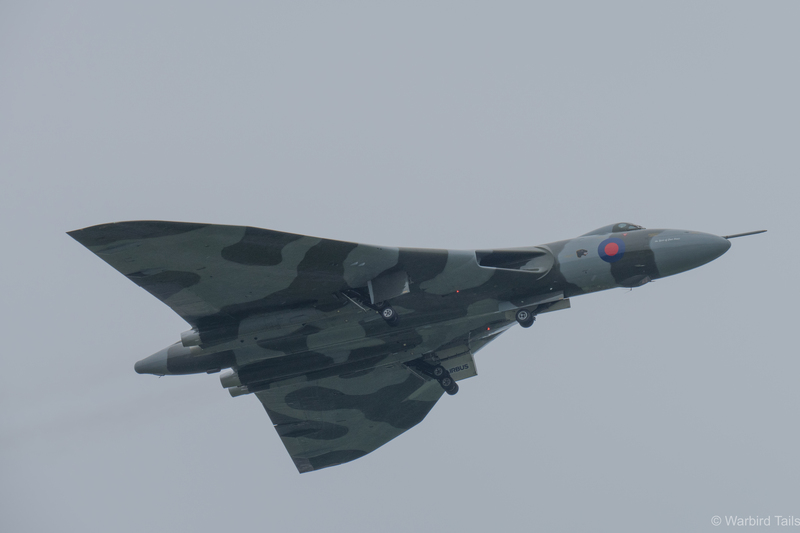 It was left to the most anticipated act of the day to open proceedings for the afternoon’s flying, in the shape of Vulcan XH558, which managed to make it down to Dunsfold despite the showers on the Saturday. (sadly the crew had to return to base on the Sunday of the show due to weather). XH558 put in a great display between the showers. 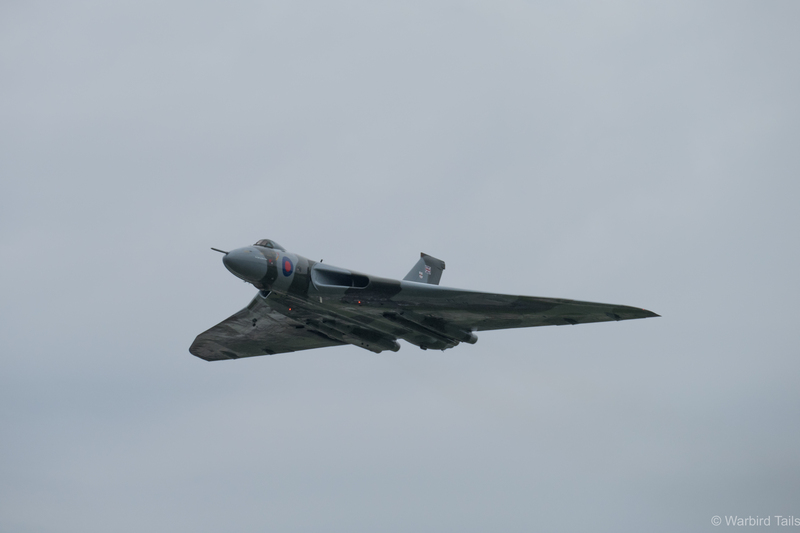 It had been announced prior the show that the CAA’s restrictions on Vintage jets wouldn’t affect the Vulcan’s routine too much and this was apparent in the display. The only real difference was the reduced bank angle during the famous wingovers. Overall I would have said that Dunsfold was one of the more impressive routines I have seen the Vulcan perform during its final season. Tucking the gear up after a missed approach. The training pair of the Bulldog and Tutor followed next, with the Bulldog initially playing the low level “joker” while the Tutor gained height for its solo display. It has recently be announced that there will be no Tutor display in 2016 which is a real shame as this years display is very well flown particularly the Hesitation and slow rolls. 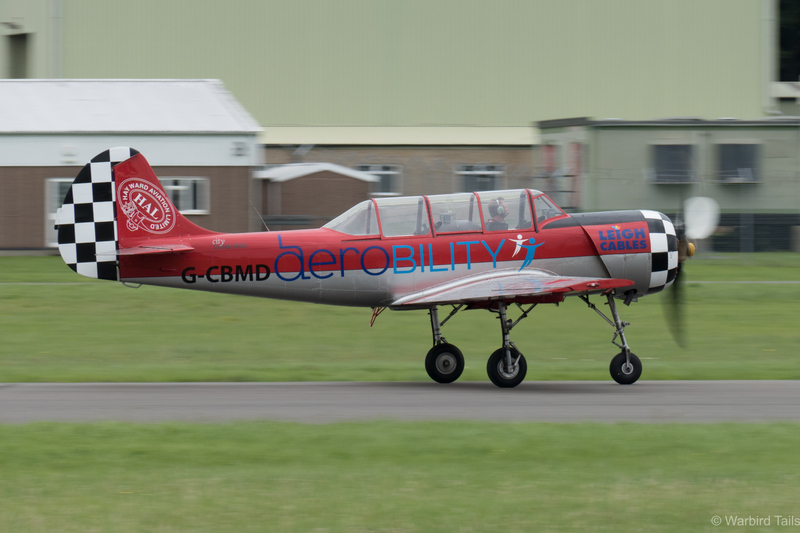 Rod Dean followed the Tutor’s routine with a flowing aerobatic routine in the Bulldog. 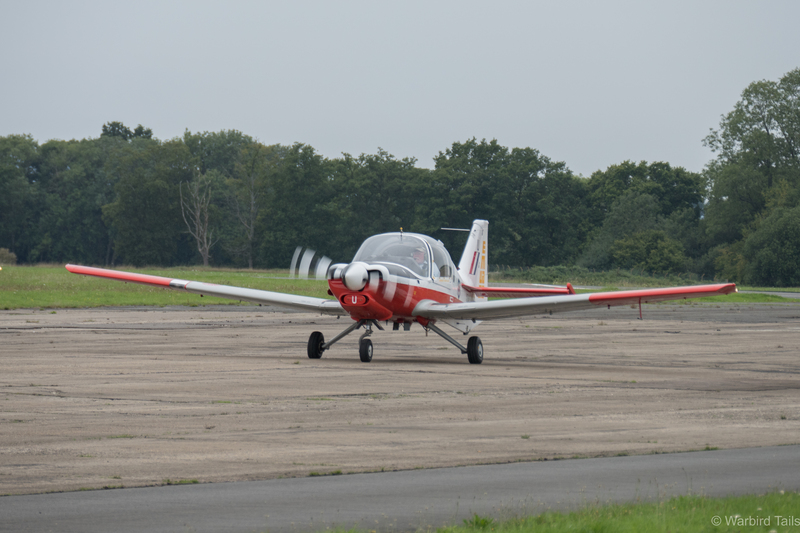 Rod Dean taxiing in the Bulldog. 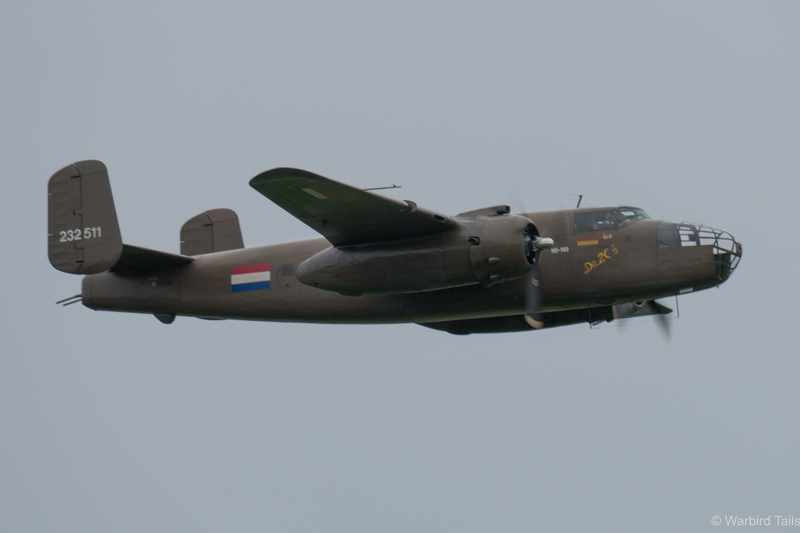 The Dutch B25 is a frequent visitor to Dunsfold and returned again in 2015, there isn’t much that can be said about this routine that hasn’t been covered before. It never fails to put a smile on your face! That unmistakable Mitchell rattle combined with some very dynamic flying makes this one of the stars of the circuit. The B25 always puts on an impressive show. A fairly new item to the display circuit and certainly to me was the Hawk T2 role demo. This display consisted of a number of passes in differing formations whilst carrying out mock attacks and battle situations. It was great to see the new version of the Hawk getting an outing on the display circuit and there was plenty of fun, noisy flying to be seen. The pyrotechnics helped add to the spectacle as well of course! The Hawk pair taxy past the B25. 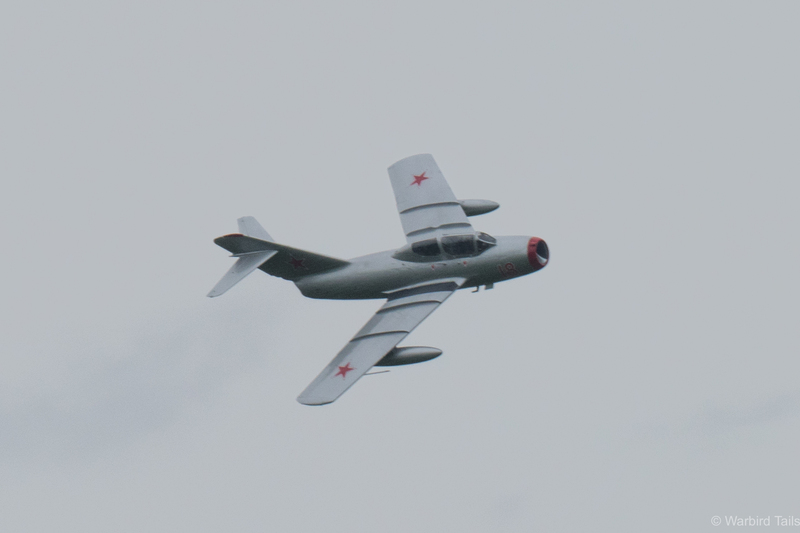 One act that was certainly a star of the show was the Mig-15 from the Norwegian Historical Flight. I was starting to think we may miss out on this display as the rain continued throughout the afternoon, but soon enough I heard the distinct rumble of an early jet engine firing up. The noise of the Mig taxiing can only really be described as very “Cold War”, it practically rattled the ground whenever power was applied. The Mig getting airborne from the “damp” runway. 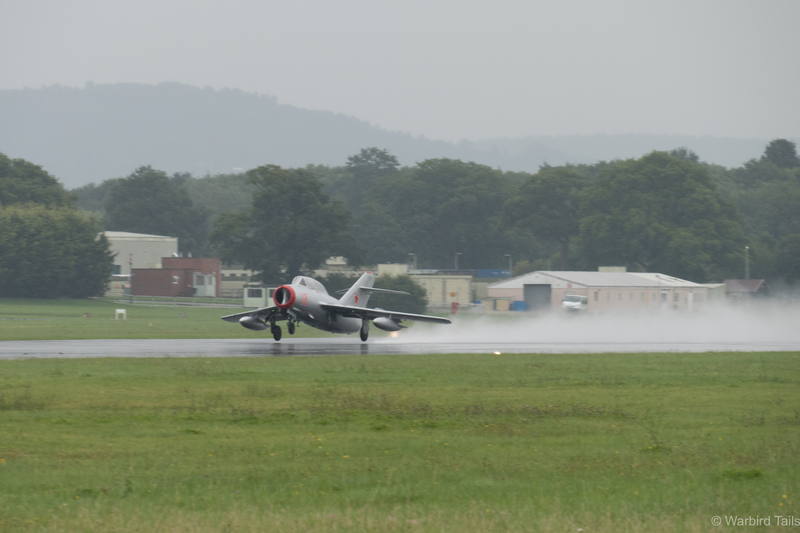 Watching the Mig get airborne from a very wet Dunsfold runway was without doubt a highlight of the season. Given the new regulations the Mig’s display was a little more conservative than it might have been but it showed this tiny fighter off very well, especially given the challenging conditions. The subdued display still featured plenty of topside passes showing of this little fighter’s lines. Aerobatic teams were on show as well at Dunsfold with a rolling display from the Red Arrows, delivering their usual polished performance against the wonderful backdrop Dunsfold offers. Later in the afternoon the Blades also displayed, though their routine was cut short owing to a microphone problem in the lead aircraft. Following the Blades early finish there was an extended break as the crowd waited for the Old Flying Machine Company pair to arrive from Duxford. Many of the crowd had already left by the time the pair finally appeared on the horizon, they missed 15 minutes of magic. This pair has always been a shining light of the UK scene but given the recent events and the damp weather they just reached another level. The Old Flying Machine Company pair put in the display of the day. Well worth waiting for. (This shot is from Goodwood a couple of weeks ago, my camera had gotten far to wet during the Mig display to risk anymore time in the rain!!). 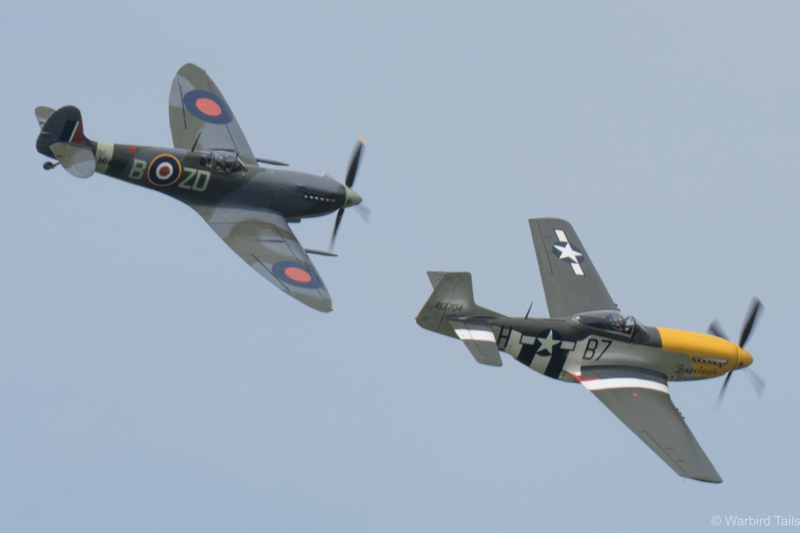 The pair performed a number of close and low formation passes over the airfield before breaking off into solo routines. Steve Jones put in a great screaming display in P-51 Ferocious Frankie before given way to Brian Smith in MH434. I still don’t quite have the words for what followed. I’ve said it before and I’ll say it again, there is no way to end an airshow quite like an MH434 solo display. This routine in particular was magic, low sweeping passes and endless aerobatics it was like they never wanted to come back down. It was a wonderful end to an excellent days flying. 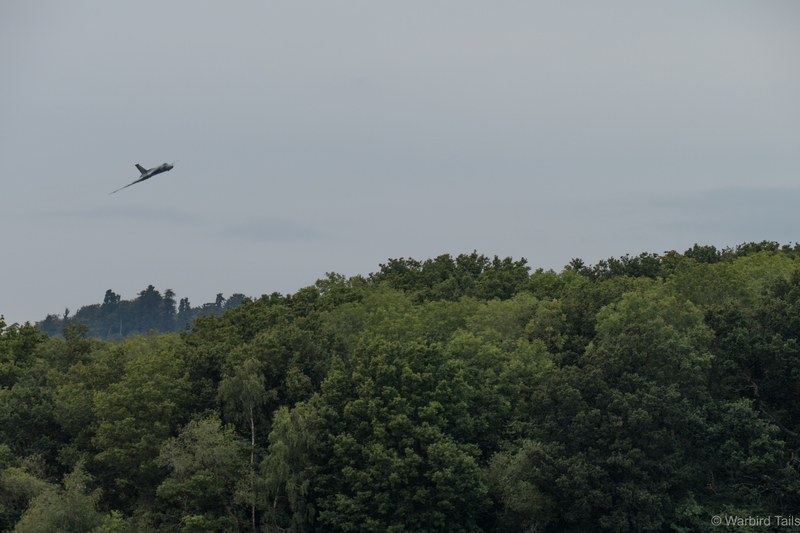 The trees and hills which surround Dunsfold have fast become airshow landmarks in their own right, long may it continue. As I said at the start Dunsfold always provides something different and always has a great atmosphere. This years show can’t have been easy to put on with the difficult times and the public eye focused on airshows, but they delivered a wonderful weekends flying and hopefully served to remind everyone why airshows are so important to so many people.